Super-easy prototyping, wireframe and mockup tool. Surface ets.) 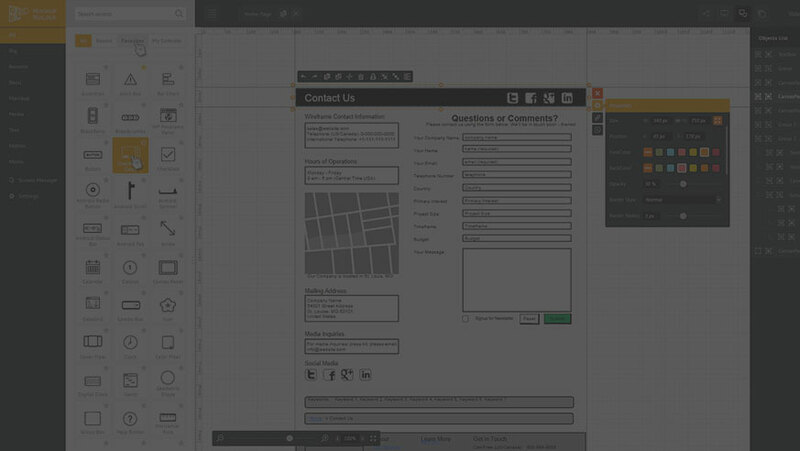 wireframes and mockups. Make, share, validate, collaborate and simply create with our convenient prototyping solution. Use our constantly growing samples gallery, to give your ideas more details in much shorter time. No matter how difficult is your software, how fancy is your web-site or how innovative is your mobile app, mockupbuilder will dramatically reduce time spent on wireframe creation and prototyping. Mockup Builder is a great tool that helped me a lot in creating web design for my clients. It helps me save time and understand better the requirements of my customers. Mockup builder is the number one solution for me when it comes to specifying functionality with my clients. I am programmer, so for me it’s easier to see the prototype and crosscheck all the details with my client in the prototype itself. What I really like in the Mockup Builder is the ease of learn and use. I also enjoy working with the samples gallery, it saves me lots of time and my team members and customers like the result. So if you are looking for one powerful, but yet easy to learn tool with plenty of convenient options, I would recommend the Mockup Builder. Good application for development teams. I and my team members use it every time we have to develop a new project. Mockup Builder lets us make sure that every team member is on the same page about software development, and helps us define responsibilities and meet deadlines. It’s a great application which I use on ongoing basis for creating prototypes. This helps me in creating basic functionality as well as explaining it to my contractors.